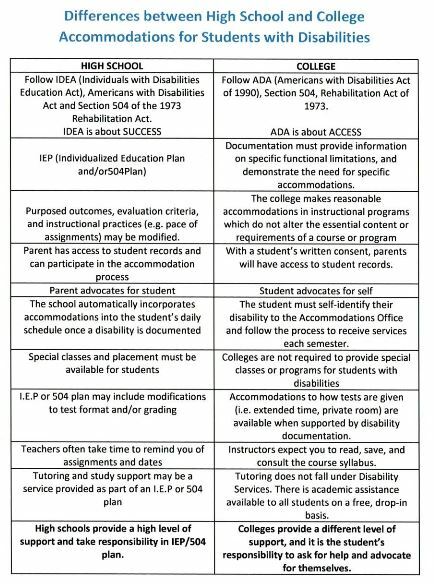 As you are planning for your upcoming IEPs, we are attaching a sheet entitled Difference between High School and College Accommodations that is used by one of our local community colleges. At each high school IEP, it is important to review all of the student’s accommodations and modifications to see if they still need/use all of them listed on the previous IEP. It is also very important to discuss that VERY FEW high school accommodations will follow them to college, and almost NO modifications will be allowed at the postsecondary level. It is important to help the student/family understand this difference and how this may impact their postsecondary planning.